My favorite film by far. 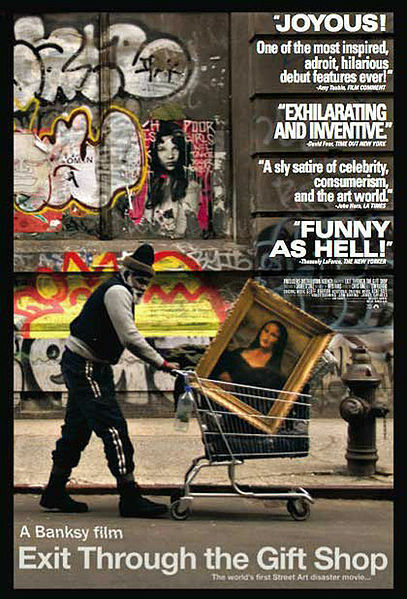 This movie is as mysterious as it’s director, the world’s most notorious anoynmous vandal – Banksy. It’s hard to comment this film – no one knows if it’s a real documentary or just another one of Banky’s hoaxes. Banksy’s directorial debut has left viewers and professional critics equally confused about the veracity of this documentary, but all seem certain that it is damn good. I left it feeling as stupid as the ‘art-lovers’ Banksy mocks in the film – giving value to what we are told is art, but quite unsure of what exactly we are looking at. It’s hard not to think we’ve all been mass-pranked by Banksy and easy to imagine him laughing at us all. Perhaps that is precisely what Banksy is trying to prove by this documentary on the origins, popularization, and subsequent commercialization of the street art movement. The movie begins in the early 1990s by telling us the story of Thierry Guetta a likeable, eccentric Frenchman living in LA who has a bizarre habit – he films absolutely everything he sees. Through his cousin, Space Invader, Guetta is introduced to the blossoming street art movement and brings his camera along on clandestine midnight vandalism sessions across LA. Through Space Invader Guetta meets Shepard_Fairey, founder of Obey, originator of the Andre Has a Posse posters and, more recently, the Hope campaign for Obama. Guetta soon becomes the trusted documentarist for the entire street art movement – for everyone, that is, except for his idol, Banksy. 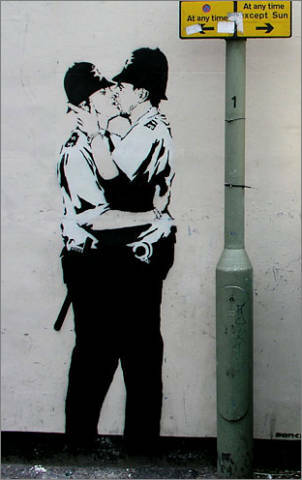 Banksy was not easy to get a hold of. The anonymous artist is an enigma – part artist, part social provoceteur, part prankster. His artwork has spread from the streets of Bristol as far as the States and on the wall dividing the West Bank and Israel. He has ‘murdered’ telephone boxes in England, decorated countless city walls worldwide, and put up his own, satirical artwork in the Brooklyn Museum. Guetta finally meets his idol and starts filming Banksy’s stunts, including placing a Guantánamo Bay detainee in Disneyland. As street art’s rising fame brings Banksy’s work to the attention of the professional world, Banksy asks Guetta to use his tapes to make the definitive documentary on the origins of street art – a movement spawned in reaction to the commercial art world that was now embracing it. The only problem? Guetta turned out to be all talk – he had a camera, but he was a worthless filmmaker. Banksy takes the tapes into his own hands and tells Guetta to try his hand at making his own art. Before long, Guetta has created his own alter-ego, Mr. Brainwash, and is preparing to make his own artistic debut in LA. At this point the whole nature of the film changes. The first half of the film focused on Guetta’s documenting the street artists’ rise to popularity, and the second half refocuses on Guetta as the embodiment of the commercialization of the same movement. Guetta has little talent – yet he receives more commercial success in shorter time than any other ‘street artist.’ Banksy playful mocks Guetta’s attempt at creativity, which is essentially copying Banksy’s and Fairey’s style and applying it to pop-art images. Guetta happily explains to the camera the genius behind his ‘art’ as we watch him hype up his debut show, showing just how subjective our values of art can be. Real or not, the buzz has made him real. His paintings have sold and he was even asked by Madonna to make the cover of her new album. The art world has picked him up, while the film’s viewer is left scratching his head, questioning our very definition of art. One last thing: on the night of the premiere, a graffiti work appeared in the Parte Vieja of San Sebastian, supposedly by Banksy himself. The choice of subject? None other than us, the public and the art world, represented by a man admiring a framed picture of nothing at all.